A crocodile preserved by a taxidermist in 1909 and then donated to a Highlands town as a museum exhibit has been thrown a birthday party. The 15ft gharial - now classed as a critically endangered species - was sent to Wick by local politician and benefactor Sir Arthur Bignold. 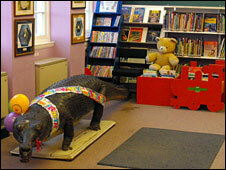 More than 50 children and their parents attended the party in the town's library, where the animal is kept. About 100 years ago the species was prevalent throughout India and Nepal. In 2007, 200 breeding adults were found to be clinging to survival in a handful of rivers. The Wick specimen was an exhibit in Wick Museum until it closed in the 1970s and was moved to the public library. Later, a suggestion by a library official that the creature be removed sparked outrage and parents sent letters of complaint. Staff came up with the idea of holding a party. Senior library assistant, Robbie Macdonald, said: "With a little bit of work, we felt he's well worth celebrating and it was the least we could do to honour such a favourite with the local children past and present. "It was a great day, the children, the parents and staff had a lot of fun, and it demonstrates that both the traditional and the new faces have a place together in the future of our library service."